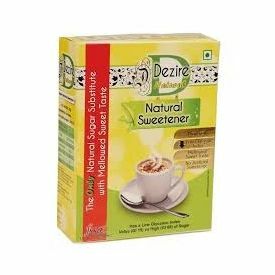 Diabetics Dezire sugar free is a natural sugar substitute that contains Levulose which is a natural sweetener with a low glycemic index of just 19. It is independent of insulin secretion for its metabolism. It has a mellowed sweet taste & enhances the the flavour of beverages without the bitter after taste of artificial sweeteners. Being 1.7 times sweeter than sugar enables calorie savings to be made. It is an ideal sugar substitute to make Payasams, Kheer & Sweets at home to celebrate special occasions so that diabetics are not deprived of the joy of the celebration. Being natural product Dezire Sugar Free does not have the side effects of artificial sweeteners. It is also available in easy to use 5gms sachets. Diabetics Dezire sugar free is a natural sugar substitute that contains Levulose which is a natural sweetener with a low glycemic index of just 19. It is independent of insulin secretion for its metabolism. It has a mellowed sweet taste & enhances the the flavour of beverages without the bitter after taste of artificial sweeteners. Being 1.7 times sweeter than sugar enables calorie savings to be made. It is an ideal sugar substitute to make Payasams, Kheer & Sweets at home to celebrate special occasions so that diabetics are not deprived of the joy of the celebration.Being natural product Dezire Sugar Free does not have the side effects of artificial sweeteners. It is also available in easy to use 5gms sachets.